How It’s New York: There’s something so NY about seeing two variations on the same story without even trying to– possibly true of many towns with a lot of theatre in them. it’s also very very NY that both shows are in venues that make finding them a bit of a challenge: there are two entrances to the Times Square Arts Center for A Night with George, and the receptionist sent me in the wrong one twice, and Reflections looks like a private apartment from the outsie (you have to be buzzed up). How It’s Irish: Both are in the 1st Irish Festival, and both plays are about women in Northern Ireland with men in prison. Here is my essay plus reviews (first appearing in this week’s Irish Examiner) of two more plays from the 1st Irish Festival, which runs through this weekend. The nominations for awaeds are posted and I’ll post them with my predictions shortly, too. What have you seen? Anything you loved? Let me know! The troops may have left Northern Ireland, but they’ve left their ghosts behind. Some of those most haunted are the people who didn’t go to prison-but were left behind by fathers and husbands who did. Like many women’s stories, it’s not as overtly dramatic as the front-line tales, and so it’s taken a while to get them out there. Enda Walsh’s 2008 film Hunger, for example, shows gruesome details of the hunger strike of Bobby Sands, but little about the impact on family. So it’s odd to see not one but two plays in the 1st Irish Festival told from the point of view of the convict’s wife (and daughter). And it’s enlightening. A Night with George, by Brenda Murphy and Donna O’Connor, produced by Brassneck Theatre Company from West Belfast, is a one-woman show in which Bridie (Donna O’Connor) talks to the a cardboard movie cut-out of George Clooney about her life (like Shirley Valentine, who talked to the wall). We learn late in Act II that the reason she’s doing this is she’s moving out of her house to start a new life. She takes us through her marriage to Seamus, his imprisonment, her years of raising her son alone, training as a nurse, then Seamus coming out of prison and leaving her for another woman. In the second half, Bridie begins life again, accepts her son Emmet when he comes out to her as a young man living in London, and, at 48, rediscovers her sexuality with an English doctor. There are a lot of laughs in this one-woman show, thanks to snappy quips and deadpan delivery. Tony Devlin’s lively direction keeps the pace high. Because she’s explaining it all to George Clooney, a handsome rich Hollywood star, she also gets to explain what Belfast was like to us. It’s a neat, if slight, conceit. She’s annoyed when Seamus puts his name forward for a hunger strike-but fortunately he’s rejected. “You have to be healthy to be allowed to die, George,” she explains. This first half of the play succeeds the most, as Bridie draws us into the tough yet banal world of pinching pennies, bringing her husband books and blue jeans, doing without. Not long after he gets out, Seamus, who’s received a PhD in prison, leaves her for an English social activist. He’d outgrown her, I overheard a woman telling her friend during intermission. Clearly, Murphy and O’Connor touched on the truth with their humor. O’Connor is a large woman with a plastic face, by turns self-deprecating and bold, and often screamingly funny. Still, it’s one of those shows where someone sings “I Will Survive” (the words gently changed here), and O’Connor distractingly fluffs several lines. It’s trying a little too hard to be heartwarming, particularly in the second half, which rushes to bring Bridie up to date. Yet many of Bridie’s frank observations have stuck with me, and there’s something grand about finding so much humor and heart in this particular situation. Reflections is the name given to two paired one-acts, joined together by the new company the British National Theatre of America. Like A Night with George, they are one-woman plays. Paula Nance performs both roles. In the first, “Twinkletoes,” by Jennifer Johnston, Karen comes from the wedding of her daughter and talks to the audience about her marriage to her Declan, who has been in prison since their daughter was eight. In the second, “Forgotten Milk,” by Bernard McMullen, Nance plays the daughter, Noreen, twenty years later. The two plays take place before and after the Good Friday Agreement. Singer Andy Mac is onstage during both, playing at times a refrigerator (he holds a flashlight when Karen mimes opening it), or singing under some scenes to suggest love or disappointment. He also sings between the two plays. Jo Cattell directs, using this original idea brilliantly. Mac is the very present absence of the missing man. His subtle responses add atmosphere without interrupting the story, and make the whole thing theatrical and fresh. It’s just the kind of creative theatricality you’d hope to see from a new play company, and it’s made me eager to see more of their work. 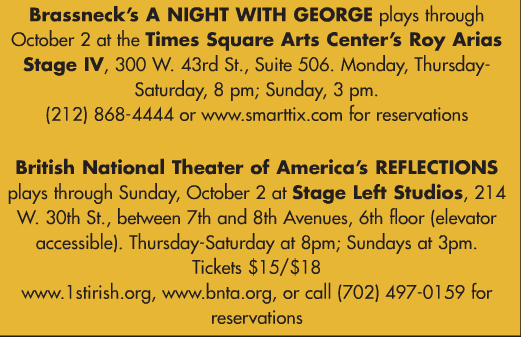 Though there is humor in both of these plays, it’s of a very different kind than the set-up and one-liner style of A Night with George. Karen is speaking in a general way about the life leading up to her daughter’s wedding. The humor is just the general, rueful kind one might have about life. Karen has had to live the sexless life of a widow or a nun, though her husband’s alive, for nine years, and at times she thinks about a man named Danny. But she isn’t a bad woman… and she still loves her husband. It’s touching and lyrical. Nance’s face goes from wistful to angry but somehow remains soft throughout. The paired play “Forgotten Milk” is somewhat less cohesive. It’s an engaging monologue anyway, because Noreen is a strong, enigmatic and often funny creation. She’s become a singer, and the husband she had to marry, whose name, ironically, is the same as her Daddy’s, Declan, is in her shadow now (and we learn that really, she married him to have a different life). She prefers singing Eagles and Garth Brooks to rebel songs in the pubs that book her because of her father’s heroic status. We hear about Noreen’s childhood, her days as an exchange student in America, and finally about how she fell in love with her baby son. She’s lived her whole life in the shadow of the Troubles, and wants it to have no part of her – yet she named her baby son after her own father. That’s a fascinating observation but it’s not really dramatized, just discussed. At times it felt a little flat, and I wanted to see her in action. Nevertheless, the pairing of the two plays, with Andy Mac’s unusual framing songs, and Nance’s vibrant performances, make the evening powerfully provocative.